Summary: How much does a mammogram cost? Well, that depends. It could be $0, and it could be $1,100 and up. For this, our final post on our crowdsourcing project with the amazing Brian Lehrer Show at WNYC, our local public radio station, we’re offering consumer advice. (Please keep in mind that we don’t give medical advice, just billing/paying advice). There is not one easy answer to the question, but we can give some thoughts and some advice. 1. Routine screening mammograms are supposed to be free for insured people under the Affordable Care Act. There are some exemptions (plans can be grandfathered, you may not be covered if you choose an out-of-network provider, etc.) but under most circumstances a routine screening test should be covered. Here is a white paper from the National Women’s Law Center about this topic, and here are steps to take if yours is not being covered. 2. Always ask up front what the price will be, and what you will be asked to pay, and for what service. A surprising number of the nearly 400 people who responded paid — a co-pay, or the full price because they hadn’t met their deductible, or some other sum. (We asked people to fill out an on-line questionnaire listing their provider, their payer, how much they were charged, how much the insurer paid, how much the individual paid, and how she felt about it.) We suggest that people always ask the price — and if your provider can’t tell you, insist. Also, ask what service is being provided: a routine screening mammogram is different from a diagnostic one. 3. Ask if the provider is in network if you’re insured. We hate hearing that people find out only after the fact that the provider is out of network, and that’s a big “gotcha.” Ask first. 4. Ask that the provider read your mammogram while you’re there. Many people told us they had a mammogram, left the facility, and then were called back for a second mammogram because “we need another view” or “there was something wrong with the film.” Then upon return, the mammogram was no longer a routine screening mammogram, but a diagnostic mammogram, which was charged differently, or not covered at all under the preventive care screening rules because in this case a diagnosis was being sought. What seems proper: For all X-rays, there are occasions when the film/recording is not technically good enough. Techs should prevent this. When it happens anyway, it seems fair that the provider should pay for a re-do. On the other hand, an abnormal screening mammogram is followed by a diagnostic one, and Medicare reimbursement rules state that a mammogram done due to some symptom, sign or other special reason (i.e., abnormal screening mammogram and physicians opinion) is a diagnostic mammogram. For Medicare, the reimbursement to provider is virtually the same for both. For the customer, screening is free and diagnostic is covered by normal sick visit rules. 5. If you aren’t insured and can’t afford a mammogram, there are many options. The Avon Foundation Breast Imaging Center, the Project Renewal Scanvan and the S.A.V.E. program at the University of Medicine and Dentistry of New Jersey are options in the New York area. Other options are also available. Planned Parenthood is a great resource, and so is your local chapter of Susan G. Komen for the Cure. 7. Are you being charged for reading the mammogram, for delivering the mammogram, copying it or whatever? Ask for the charge and any extra billing codes. If it seems fishy, ask again and ask if it’s a mandatory charge. The weirdest thing we heard was of a person being charged for receiving a mammogram. Yikes. 9. Hospital mammography facilities charge more and are paid more than self-standing clinics in most cases. 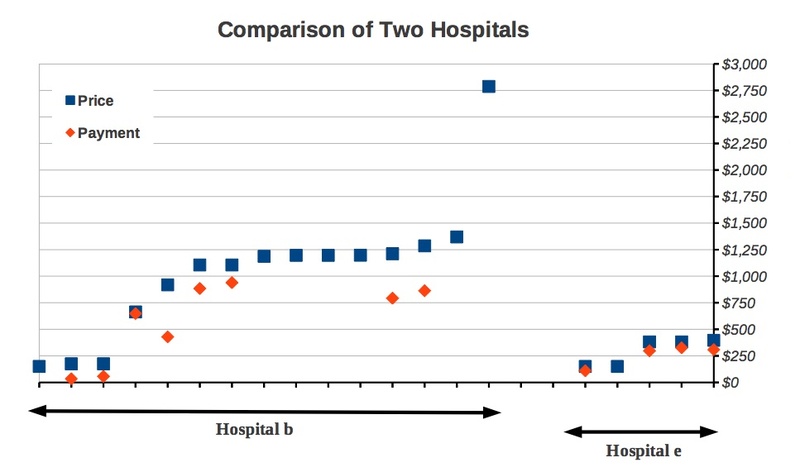 In the graphic at the top, we compared hospitals to self-standing clinics. But we were surprised to notice that there are wide variations; one very well-known New York cancer treatment center came in at a very low price, while another was extremely high (see the chart at right for charges and payments). 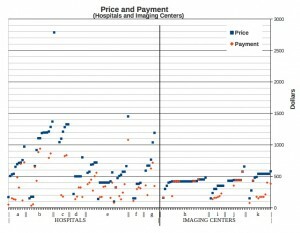 Hospital “B” has reported prices (blue squares) ranging from below $250 to above $2,800, with the typical reported price around $1,100. Reported payments (orange diamonds) are typically quite a bit below the price. For Hospital “E”, the reported prices range from below $250 to about $400 with reported payments of close to the charged amount. We decided not to name all the payers and providers who contributed to our crowdsourcing project, on advice of our lawyers, but in this case we think it’s important to shine a light on someone for doing good. Hospital “E,” which we expected to be very expensive, is not. It is Memorial Sloan-Kettering, the top-notch New York cancer center. Good on you, MSK. 10. So how much does a mammogram cost? Here at clearhealthcosts.com, we do pricing surveys for the self-pay prices for common procedures. What we have found here in the New York area is a range from $50 to over $600 for a mammogram if you ask in advance and pay cash; here’s our price list for New York and here’s one for Los Angeles. Here’s a list of mammogram prices in the Houston area. Here’s a list of mammogram prices in the Dallas-Fort Worth area. To sum up: Mammograms are big business, especially when you consider that 37 million mammograms are performed in this country every year. Pretty much every woman in the US starting somewhere 40-50 has a mammogram every year, or regularly, usually without knowing what the cost will be. Also, consider this: mammograms are supposed to be routine, and straightforward, and one would think that there’s more consistency in price. Not so, our community told us. Also, in this and any other part of the marketplace, it pays to call ahead and ask. You’ll be surprised how different the self-pay price can be at different providers. If you are uninsured, call ahead and ask what the price will be. Offer to pay on the spot and ask again. Take down the names and dates of people you talked to, in case they are useful after the fact. If you take this idea from a fairly calm quarter of the health-care marketplace and imagine what it looks like elsewhere, you’ll get a picture of what we’re trying to solve. Forget mammograms for a second, think about this: What percentage of women between 15 and 50 are taking birth control pills that have differences in cost by a factor of 10 from providers for exactly the same brand, as we learned in the other part of our project? A caveat: this is crowd-reported data. Those reporting may have mistyped, or the price may be for a more complex evaluation. We asked for “routine mammograms” but some people clearly reported in with a history of breast cancer and also with diagnoses that were found via mammograms. But in any case, we had about 400 people with significant data, and we consider this a very meaningful data set. What we do know: it shouldn’t be this difficult. Prices should be published. We should know what procedure we are having and what we will be charged. And to our contributors, again, thank you. This is part of our WNYC “price of a mammogram” series. Other posts are here. 1. Where’s my free mammogram? 2. The overview: How much does a mammogram cost? Prices, payments vary widely, our survey with WNYC finds. 3. We don’t offer medical advice, but we wanted to tell you about the guidelines. When is a mammogram not a mammogram? 4. How much does a mammogram cost? Your tales of bills: $0 to $2,786.95. 5. Women’s health resources. No one should ever have to go without a mammogram or other women’s health issues. Reproductive health belongs to us. Here are some resources, and some thoughts about women’s health. 6. Acts of healing, and of overcharging: Contributors talk about their mammograms. 7. How much does a mammogram cost? The takeaway. 8. How should you choose a mammogram facility? Dr. Geraldine McGinty explains.